All of the flavours of jalapeno poppers in a quick and easy chicken casserole for dinner! I am obsessed with jalapeno poppers! 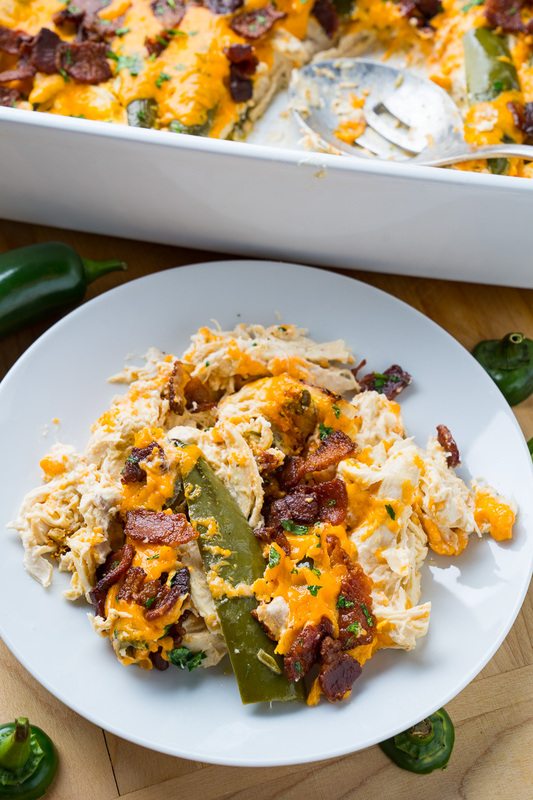 There is just something that is completely irresistible about the combination of spicy jalapenos and hot meted cheese, and things only get better when you throw in some chicken and bacon! Jalapeno popper dip is a great way to enjoy all of the flavours of jalapeno poppers in dip form but what about for dinner? 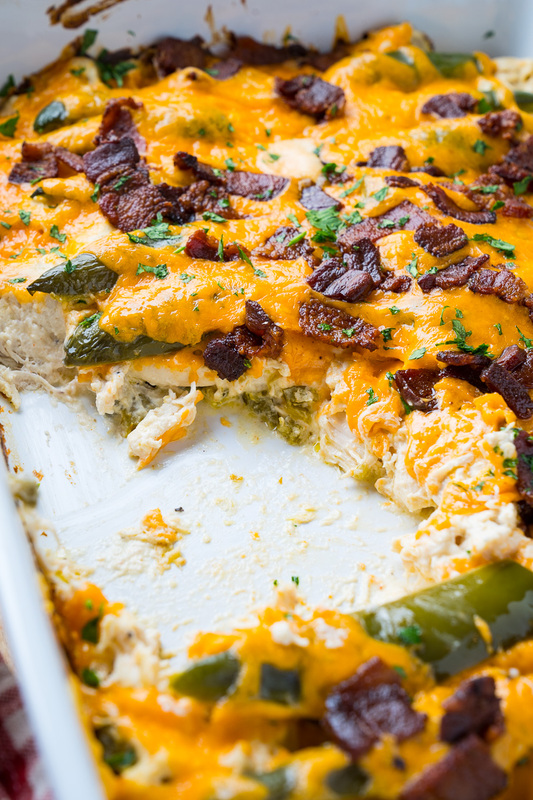 How about a jalapeno popper chicken casserole? This casserole is basically just chicken and jalapenos mixed into a cream cheese and topped with cheddar cheese and baked until bubbling and golden brown! Sour cream, mayo, paprika, onion powder, garlic powder and parmesan cheese all add flavour to the cream cheese base making it so delicious! You really can’t go wrong adding a sprinkling of bacon to finish things off! Who says you can’t have jalapeno poppers for dinner? 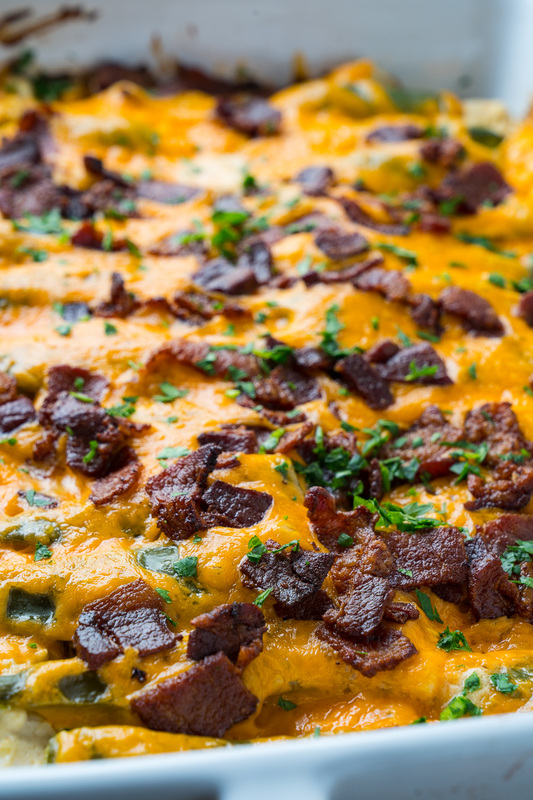 This chicken jalapeno popper casserole is the perfect way to! 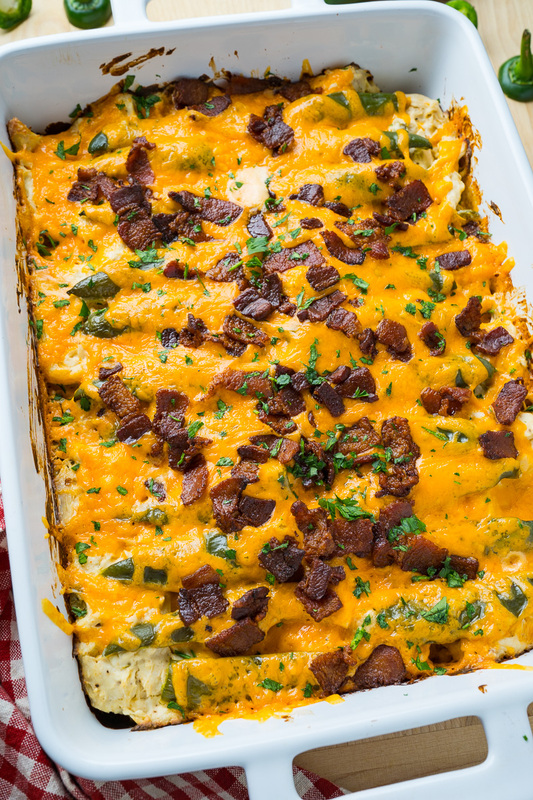 Mix the chicken into the mixture of the cream cheese, sour cream, mayo, garlic powder, onion powder, paprika, salt and pepper, jalapenos, mozzarella and parmesan and place into an 8 inch square baking pan before sprinkling on the cheddar cheese and bacon. Bake in a preheated 350F/180C oven until the cheese has melted, turned a light golden brown and the sides are bubbling, about 20 minutes. Option: Replace the mayo with more sour cream or omit. Option: Use whole, uncooked, boneless and skinless chicken breasts of thighs and bake 40 minutes. This was amazing my family loved it! i’ll try this later in the week. did you use fresh jalapenos? I usually use fresh jalapenos but pickled are also great! Enjoy!